The Canard table system features folded metal-sheet legs that surround the corners of the MDF-reinforced, panelled table top, creating a solid structure of highly contemporary design. 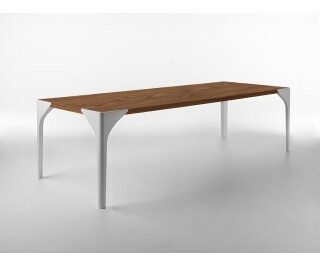 Table with top made from lacquered or veneered honeycomb board, reinforced inside with aluminium strips. Legs made from folded and varnished metal sheeting, 8 mm thick.